Iggy and the Stooges have long since been one of my favorite groups of all time. The Stooges, Funhouse and especially Raw Power were constantly in rotation in my teenage years and still manage to pop up in my MP3 player frequently. Hearing that the band were going out on tour last year to perform Raw Power with guitarist James Williamson was very exciting and getting to actually see it on DVD is even better. Recently released from MVD, this important document was a must see for a long time fan like myself. 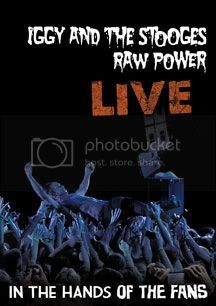 Raw Power Live is not your average concert video. 6 fans were selected to film a performance of Raw Power at the All Tomorrow's Parties Festival on September 3rd, 2010 from different angles, which would be edited down into this here video. The fans also got to interview the band, which is included here too along with liner notes by the band's current bassist Mike Watt (The Minutemen, fIREHOSE). The band rip through the entire album and encore with some of the group's other classics like I Wanna Be Your Dog, No Fun, 1970 and more. Iggy Pop, who was 63 years young when this was filmed last year, proves here that he still has it. Shirtless (as usual), Iggy runs around the stage, dancing, jumping and just going nuts. His voice doesn't seem to have aged at all and his band mates (Watt, Williamson and original drummer Scott Asheton) are all in top form. After hearing this material played over the last 30 years by different groups of musicians backing Iggy, it's great to hear them played by 3 of the originals (and Watt, who can do no wrong in my book). The interviews filmed by the 6 competition winners were also great to see. Hearing these guys speak out, especially Williamson who has been out of the music business for 30 years, was a fan's dream come true. Overall, this DVD is a must for fans of Iggy and the Stooges, classic punk and just good old dangerous rock n' roll.